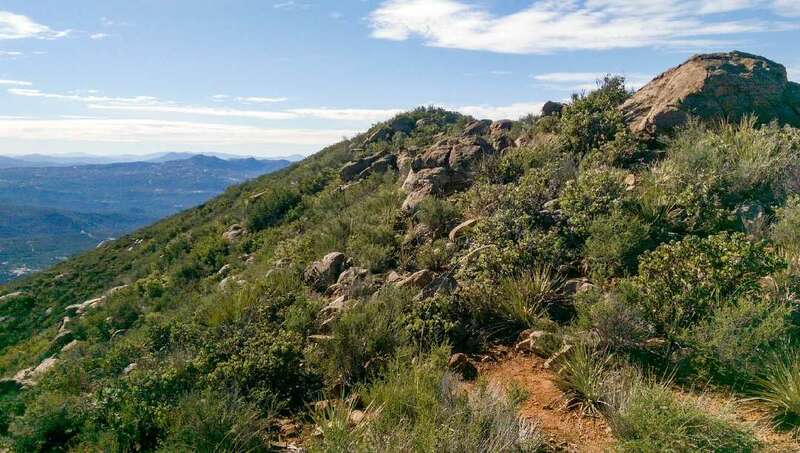 Viejas Mountain is a fun, challenging hike that’s perfect for a quick workout and some good old nature time. 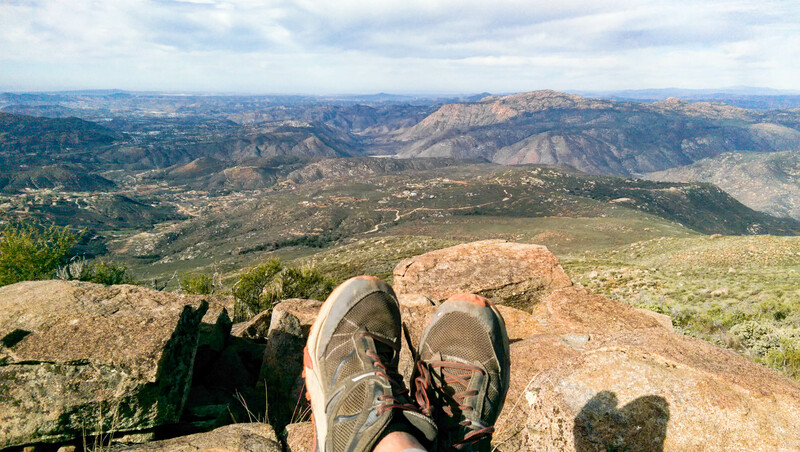 The 360 degree panoramic views from the summit of Viejas Mountain are spectacular, so lace up those hiking shoes and head for the hills. 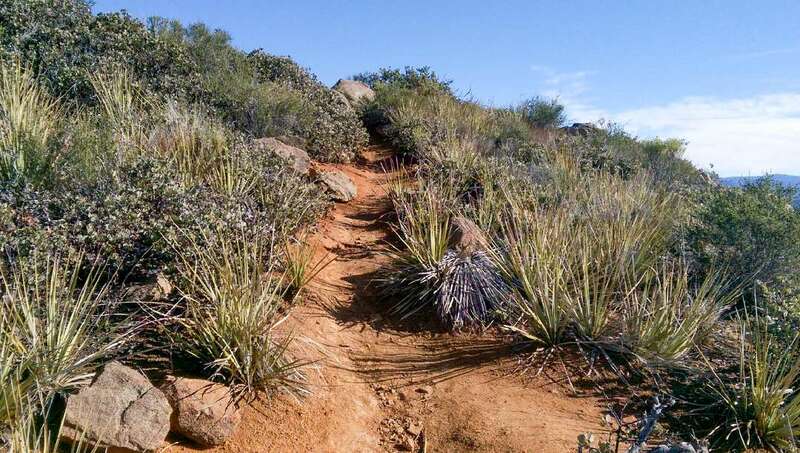 From Viejas Mountain’s trailhead, you immediately begin your steep 1.5 mile ascent up the rugged trail to the summit. Wear a good pair of hiking shoes or trail runners and you will have no trouble navigating the more technical sections of the trail. 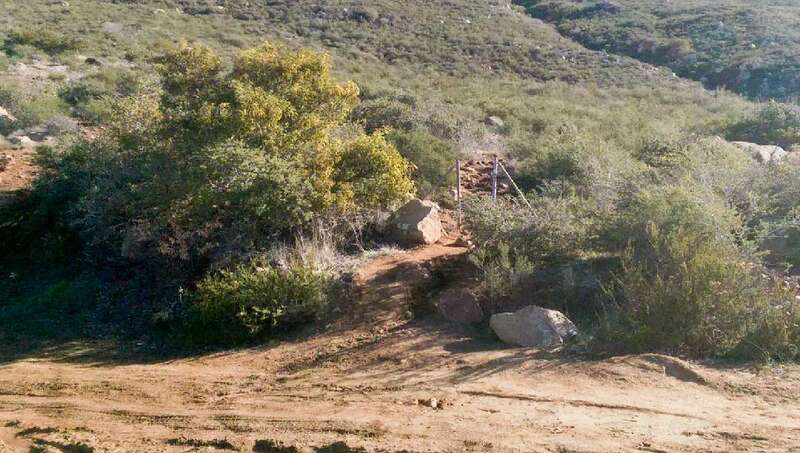 The trailhead, seen hidden behind the bushes, can be easy to miss from the road. As you continue your climb, the valley view expands to a panoramic scene that reaches from the Mexican border to Orange County and beyond. 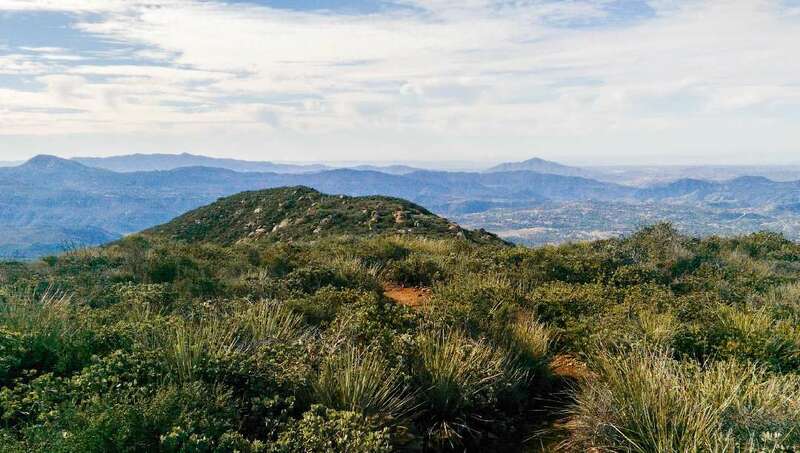 From the top of Viejas Mountain trail, you can either head north towards the summit or south towards the two neighboring peaks. None of the three peaks have much prominence, and they are all very easy to reach and offer a unique perspective of the surrounding scenery. 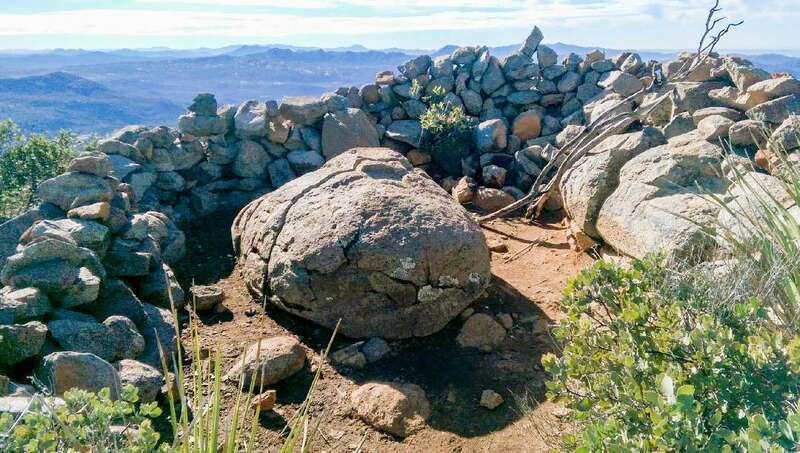 What is that Mysterious Stone Structure? 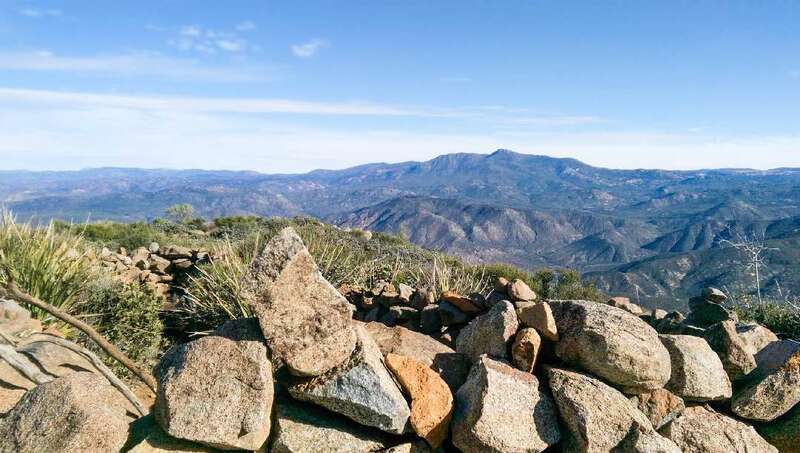 The summit of Viejas Mountain is marked by a stone wall structure that was erected after campers destroyed the site during the 1970s. This stone structure used to be an ancient Indian ceremonial site. 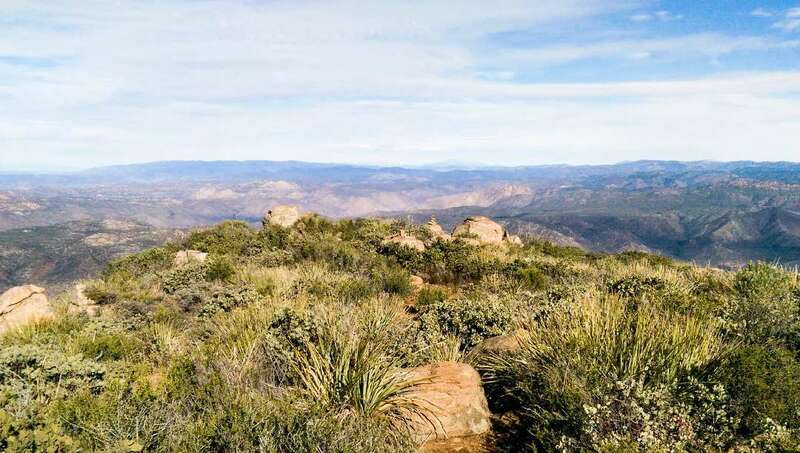 Take a look around from the summit of Viejas Mountain on a clear day and what you will see is astonishing. 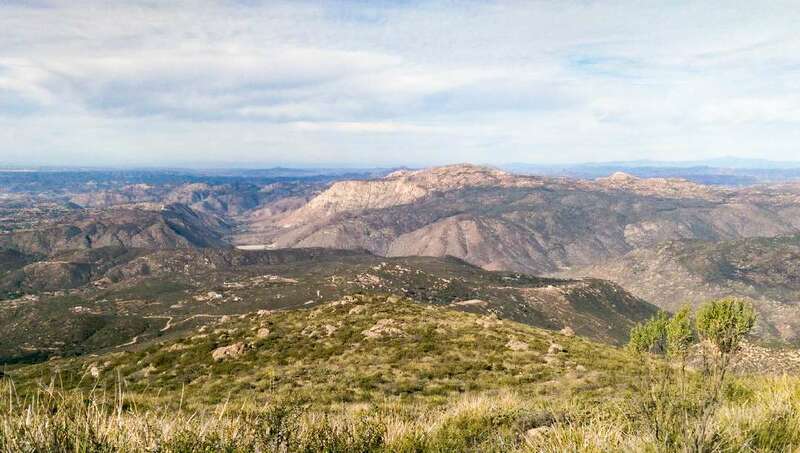 On the day I hiked Viejas Mountain I was able to see the snow capped peaks of San Gorgonio and San Jacinto to the north beyond Cuyamaca and Palomar mountains. 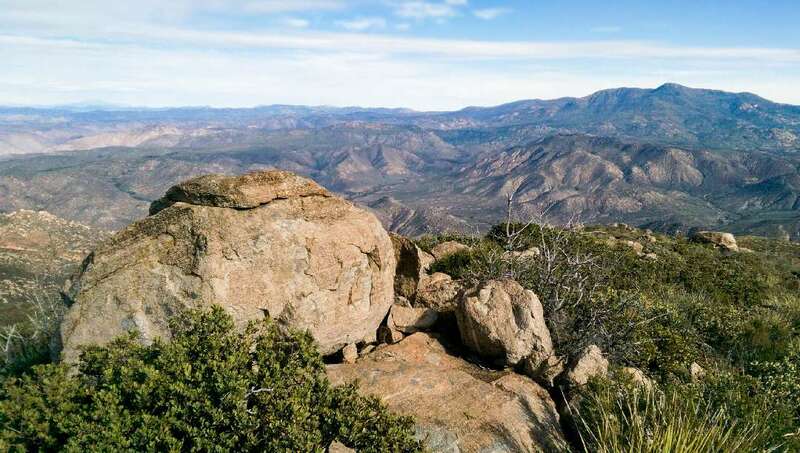 The eastern views were filled to the brim with the towering peaks of the Cleveland National Forest. To the south Lawson Peak, Gaskill Peak and Otay Mountain were all visible, as well as the Coronado Islands to the southwest. Looking west past El Cajon Mountain and Mount Soledad was the glimmering Pacific Ocean. San Jacinto Peak visible far left in the distance. Cuyamaca Peak stands tall to the right. ← Four Things You Need to Know to Plan a Successful Backpacking Trip in Joshua Tree.